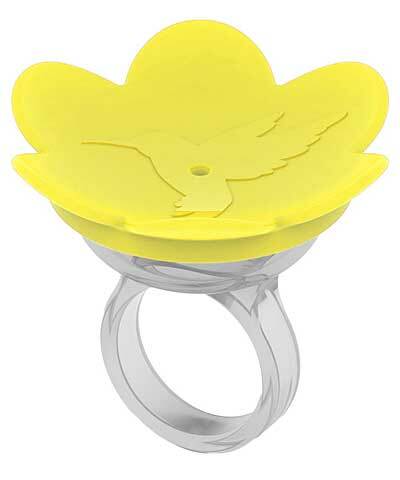 Watch hummingbirds feed like never before with this Songbird Essentials Yellow HummerRing Hummingbird Feeder. This adorable, plastic feeder adds vivid color to a potted plant or your table, thanks to its bright yellow top. The rounded, bottom reservoir holds 0.3 ounces of nectar, and a single hole in the center of the cap allows one hummingbird to feed easily. Once the birds are acclimated to the feeder, slide its base onto your finger to wear it as a ring. Remaining still and extending your arm outward invites these flying jewels to land and dine, so you can watch their feeding habits up close. The cap lifts off the bowl for cleaning and refilling, and the plastic construction forms a lightweight and low maintenance item. Become closer to your hummingbirds than ever before with this Yellow HummerRing Hummingbird Feeder. Made in the USA.